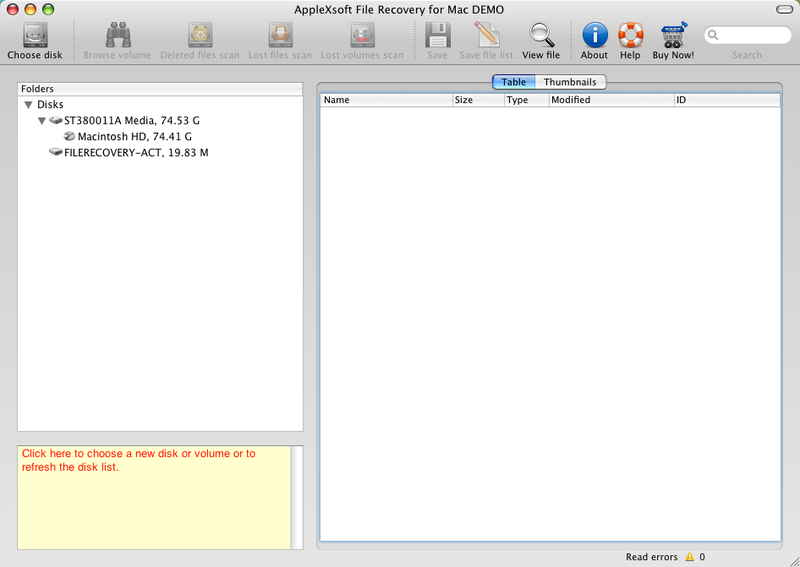 Safe, read only Mac file recovery to preserve all data. Recovers all types of files from your hard drive and flash drive. Easy to use. Recovers your files with only a few clicks. 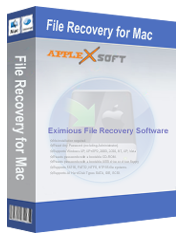 AppleXSoft File Recovery is one of the easiest to use and best Mac file recovery software that can recover data from deleted, formatted or corrupted hard drives on Mac computers. It's easy to use, and because it won't write to the drive you are recovering from it's safe, and cannot harm your data. Use File Recovery for Mac to recover lost data whether it has been accidentally deleted, the drive has been formatted or partitioned, or if it won't mount or boot. Just start the program and select the disk volume you want to search. If the drive won't mount then select the physical drive. Next you specify the type of file you want to recover. This will save time and make it easier to find what you want. The Deleted files scan allows you to quickly recover data that have been accidentally deleted, which is the most common type of data loss. 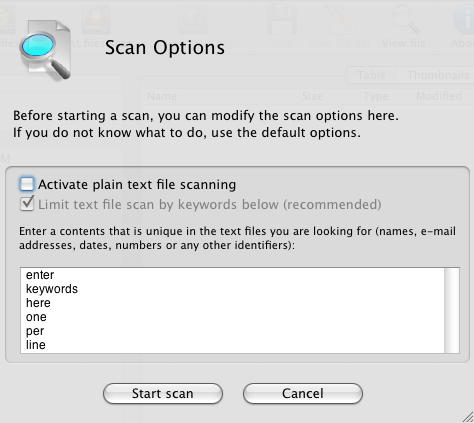 File Recovery for Mac will start to scan your hard drive and a list of deleted files will start to appear. You can see thumbnails of many file types, such as photos, and click to preview them. Select the files you wish to recover and save them to a new location..
Lost files scan lets you recover files lost by any other reason. This scan takes longer and may find more files. As with the deleted files scan you can preview many file types before recovery..
Lost volume scan allows you to recover disk volumes that have disappeared or fail to mount. File Recovery will display a list of volume names and you can then recover them..
A Thumbnails mode shows thumbnail images of many files that can be recovered. This is especially useful when recovering deleted or lost photos. 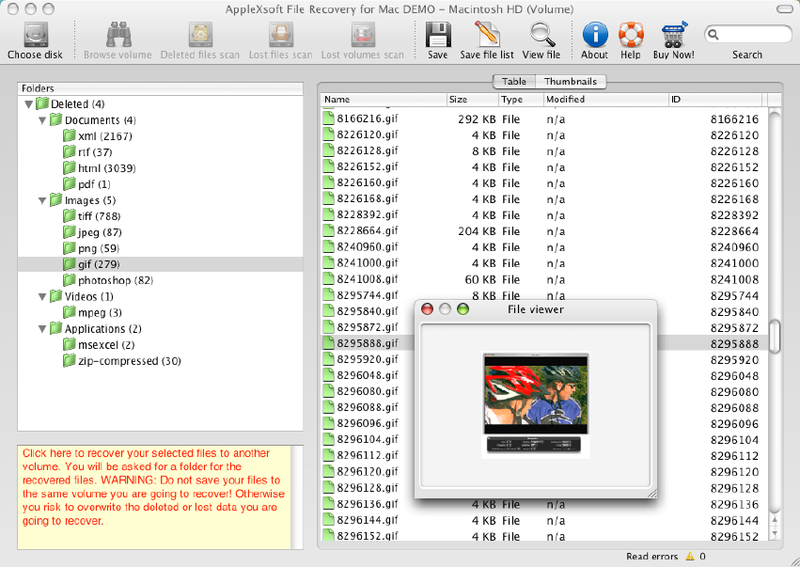 Mac Digital Media Recovery Recover Photos, Music, Video, files from any Digital Media. File Undelete is an easy to use, affordable do-it-yourself data undelete solution.